Who is Talbot Fantasy Vince??? You may have noticed the strange picture in the upper-left corner of my page. Who is this person? What is he holding? Why can't Vince draw decent pictures? Well finally your questions are answered. Back when I lived in Talbot Hall, I wasted a large part of the 1999 Spring semester watching Pete play the video game Final Fantasy 7. At some point, when we were most likely addled by lack of sleep, we wondered what the game would be like if the main characters were replaced by the people from our apartment. An entire plot was devised by the usual suspects [the ones that helped write the Talbot poetry]. I forget the whole story behind my character, but I drew a picture of him on a whiteboard and liked it so much that I scanned it at move-out time and put it on my website. (Note, I apparently was confusing this story with a Metrocat story. The TFV drawing came from the design document seen here). 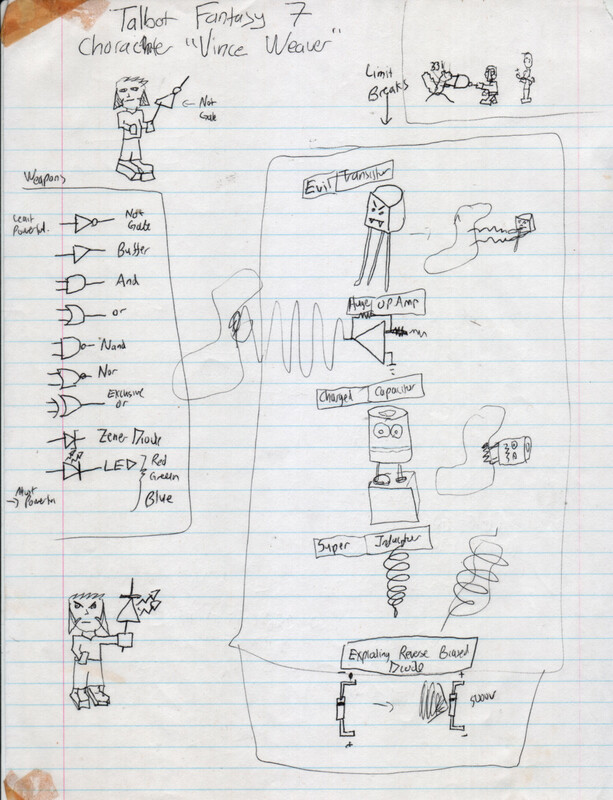 Talbot Fantasy Vince is an electrical-engineer, so his various weapons are schematic symbols. In this case he is holding the symbol for an LED. The blocky appendages, the angular hair... these are all references to the blocky graphics in the original video game. And let me tell you, his limit breaks are awe-inspiring. And this concludes "Over-elaborate answers to questions you never would have asked" for today.